These websites are designed to look like legitimate sites and incorporate some facts into their stories, but the articles are false. They are an attempt to convince readers to pass the news on as if it were true. These fake news sites get revenue from the ads you see on the page. Satire websites are sites that may be topical, but the stories are not real and meant to be humorous. These websites also have bits of true stories but insinuate and make up other details to create an emotional response, typically anger or fear. Most of these are conspiratorial in nature, are very unreliable, and frequently shared on social media. The stories often feature outrageous headlines in all capital letters. How does "Fake News" work? A Washington Post article on how the creators of "Fake News" make money. Interview with a person who creates "Fake News." 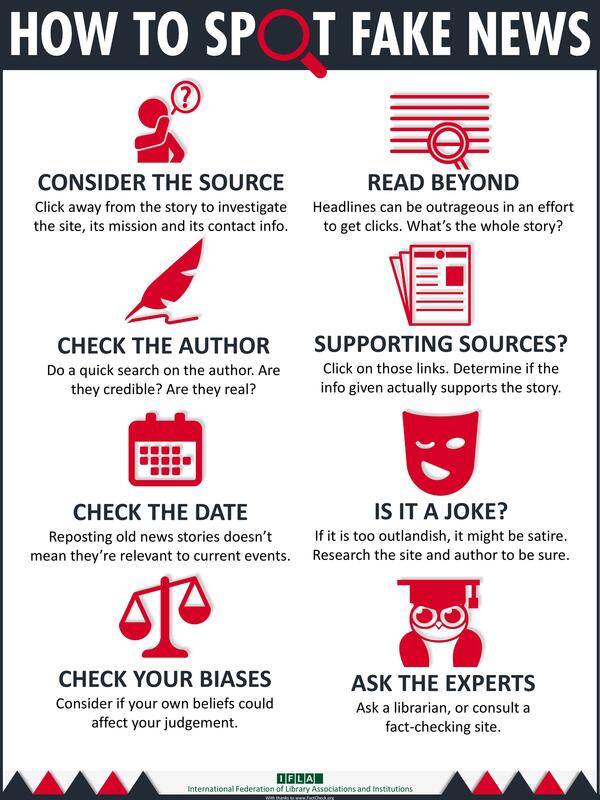 Step-by-step story of the creation and publication of a false news story. Profile of town in Macedonia where "Fake News" is created for profit. Interview with NPR about how "Fake News" spreads and why people believe the stories. New York Times article about how one tweet became fake news. Focus on social media's role in spreading "Fake News."